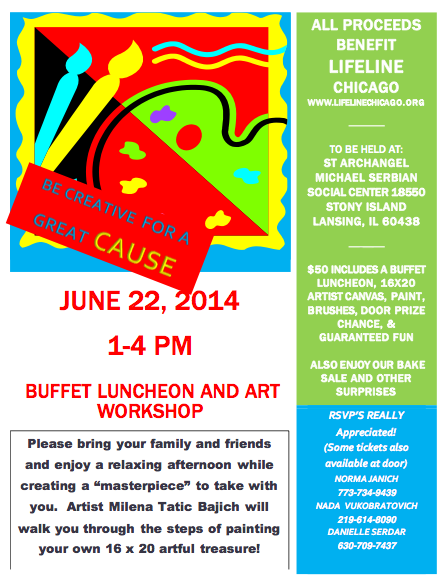 What a great way to spend an afternoon, and you’ll be helping the efforts of Lifeline Humanitarian Organization. Enjoy a light luncheon buffet as you paint your way through to a final masterpiece under the guidance of artist Milena Tatic Bajich.. Encourage your daughters, mothers, and friends to participate. Event date is Sunday, June 22nd from 1 p.m. to 4 p.m. at St. Archangel Michael in Lansing. Lifeline has directly helped Serbian orphans and victims of war and natural disasters. Details below.